This post is sponsored by Premier Protein. I am a paid Premier Protein Ambassador. All opinions are my own. This post may contain affiliate links. That means if you click a link in this post and make a purchase, I make a small percentage of the sale with no additional cost to you. No one is getting rich here, it just helps with the running (pun intended) of this blog. Starbucks took over my social media feeds the last couple of weeks with their Instagram-friendly Unicorn Frappuccino. It's pretty, y'all! Apparently, if you are trainer or a fitness professional, it became your civic duty to inform the world how terrible these are for your health. For every post of someone showing off their unicorn there were two posts from trainers warning of the sugar content. I look at it a different way. I get it. It has a lot of sugar. Sugar is bad for you. We know. It has about three days worth of added sugar, when you consider the health recommendation to keep added sugar intake to under 25 grams a day. 1. If you don't usually eat a lot of sugar and this drink makes your heart happy with all the pretty colors, then by all means, order the limited-edition drink, post your picture on Instagram and move on with your life. I am certainly not recommending you drink this much sugar on a regular basis, but if it is a one-time thing and it makes you feel happy, it won't kill you. Drink it, enjoy it, move on. 2. If you do usually eat a lot of sugar, this product isn't much different than many unhealthy foods out there. 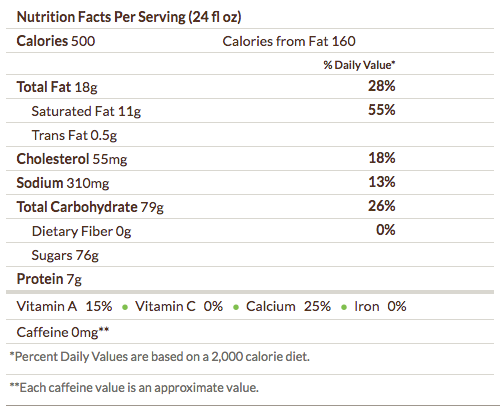 It isn't even the highest sugar content product on Starbucks menu. Honestly, if you are making a big deal about the amount of sugar in a unicorn frappucino, then you haven't been paying attention. There are 65 grams of sugar in a 20 oz coke, I don't see people freaking out about that. There is a lot of added sugar in most processed foods. This isn't news. I definitely think people need to pay attention to their added sugar intake, but sugar-shaming (aka unicorn shaming) isn't the way to do it. I personally was not drawn to the Unicorn drink. I like girly things as much as the next gal, but I know since I don't usually consume a lot of sugar, that this drink would make me feel icky. The thing is when you don't eat a lot of sugar, then things like fruits and berries taste very sweet and delicious. 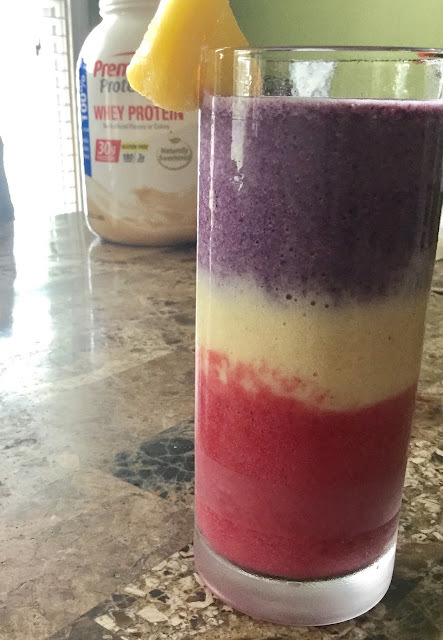 I know I can't compete with the famous unicorn frappuccino, but I set out to make a high protein, health-friendly, pretty drink. 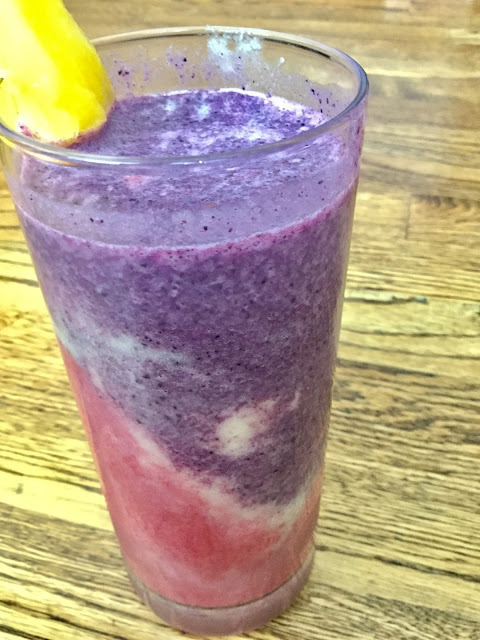 I did some searching on the internet since I am sure I am not the only one who had this idea to make a healthy unicorn drink. Most of the recipes I found broke my first rule of protein shakes: must contain easy to find ingredients. Many included things like turmeric, beet juice and food coloring (food coloring is totally cheating). I made my shake in layers. To start I mixed the frozen raspberries, 1/3 of the protein powder scoop and water in my Nutribullet. I poured into a separate glass and placed in the freezer to set. I rinsed the cup and made my second layer. Frozen pineapples, small banana, 1/3 protein powder scoop and water to mix. I rinsed the cup and made my third layer. Frozen blueberries, 1/3 protein powder scoop and water to mix. I let it all sit in the freezer for about 20 minutes, then I combined the layers and stirred them up with a straw. Pretty, right? It was pretty delicious too. Need help with your nutrition strategy? Tired of dieting? Want help developing healthy habits while staying sane and balanced in order to manage your weight over the long term? My nutrition and lifestyle coaching program begins in June, get on the list for a big pre-sale discount. I am a NASM personal trainer, RRCA adult distance running and nutrition coach that specializes in strength training for runners. I offer in-person training in the Shredshed, online training, nutrition coaching and Fit to Run bootcamps. If you are interested in a more in-depth running or strength training plan, please contact me. Have questions? I'd love to help. This is an opinion blog. No information in this blog is intended to be taken as medical advice or prescription. Please see your doctor and/or registered dietitian for any health concerns. I agree with you that people went overboard with the shaming. 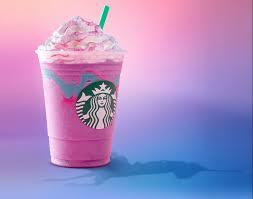 I know my teenaged self would have loved the Unicorn frap, but these days I can't handle that much dairy and sugar--I would have felt awful. Side note: is turmeric hard to find out by you? I can find it in the grocery store and even at Costco. I wonder if that's just a west coast thing.